What’s in the Malaysia-Saudi Arabia Counterterrorism Center Shutdown? A closer look at a recent development and what it means for Malaysia’s foreign and defense policy. This week, Malaysia’s defense minister made headlines when he announced that the Southeast Asian state would close a Saudi-backed counterterrorism center that had just been opened last year. Though the move itself was unsurprising given previous comments made by the new government, it has nonetheless fed into broader questions about how defense and foreign relations are being managed and how Malaysia’s contribution to regional and global security could evolve in the coming years. As I have noted before in these pages, under the previous government led by Prime Minister Najib Razak, Malaysia had taken a series of steps that suggested a closer alignment with Saudi Arabia amid growing turmoil in the Middle East and the rising threat presented by the Islamic State. This included sending armed personnel and equipment to Riyadh back in 2015 for the expressed objective of evacuating people trapped in Yemen, joining a Saudi-led, 34-member Islamic alliance against the Islamic State, and the opening of a center with Saudi Arabia to counter radical narratives called the King Salman Center for International Peace (KSCIP) (See: “Where is the New Malaysia-Saudi Arabia Counterterrorism Center?”). Despite repeated denials by the Najib government, perceptions had remained among some that it was having an overly warm relationship with Riyadh for a mixture of political reasons that could have negative implications for Malaysia’s foreign policy. With a new government coming to power following elections in May, there was a sense that some of these activities could be reviewed or even potentially terminated. A case in point was last month when Malaysia announced that it was withdrawing its military presence from Saudi Arabia. This week, in yet another significant development within this context, Malaysia’s Defense Minister Mat Sabu announced that the government would shut down KSCIP. According to him, KSCIP’s operations, including work at its temporary office, would be ceased with immediate effect, along with plans to build the center in Putrajaya, with the Malaysia Institute of Defense and Security said to be taking over its roles and functions. The decision came as little surprise to those who have been following the government’s previous comments on the issue. While no official reasons were given for the closure itself, government officials had previously indicated that it was keen to distance itself from Najib era initiatives that were seen to undermine Malaysia’s traditional nonaligned foreign policy stance. Nonetheless, the shuttering of the center does raise some questions for the new government and how it is handling the country’s defense policy. One aspect of that is political. 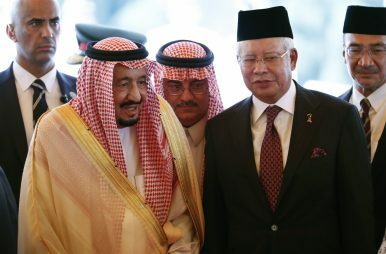 Already, former government officials, including Najib himself as well as ex-defense minister Hishammuddin Hussein, have claimed that the move represents yet another example of the new government’s unnecessary complication of Malaysia’s relations with Saudi Arabia. To be sure, reality is much more complex than that simplistic claim might suggest. Saudi Arabia, like other countries Malaysia has relations with, has had to adjust to the changes of a new government, and this is only one aspect of broader ties. Nonetheless, the claim could take on broader resonance among segments of the population if it is used to justify wider arguments against the government, whether it be performance-related issues tied to its mismanagement of foreign relations or identity-based narratives surrounding its neglect of issues that affect Muslims. Another key aspect is what it says about Malaysia’s contribution to the wider region and the world. For all its limitations, KSCIP had been perceived – rightly or wrongly – as part of Malaysia’s wider contributions to the fight against terrorism and to contribute to regional and global security. The closure of KSCIP risks feeding into a broader narrative that Malaysia may be more inward-looking during the current government’s tenure than it had been under the Najib government. To be sure, it is still early days, and the government could easily undo much of this by articulating a more positive, forward-looking a new vision of how Malaysia sees itself as a regional and global security contributor. But unless and until we see such messaging, that vacuum only increases the risk that individual headlines such as this one will continue to fill that space. Where Is the New Malaysia-Saudi Arabia Counterterrorism Center? Both sides continue to make progress on the establishment of the new institution.